In her book People and Permaculture, Looby Macnamara speaks of the way we humans have a penchant for categorizing, compartmentalizing and for creating boundaries between things (where boundaries do not really exist) to facilitate our understanding of the world. This division does allow the human mind to begin to understand complex systems. At the same time, however, there is a danger of losing sight of the bigger picture and therefore our ultimate goals, which can prove counterproductive. “Can’t see the forest for the trees,” as the old adage reminds us. One paradigm informing our current civilization is that humans are separate from nature, an idea reinforced throughout the development of Western religion and philosophy. Because it emerged in the context of this paradigm, the mainstream environmental movement of the late 20th and early 21st centuries has undermined its own intentions. By envisioning humans as separate from the environment, a dichotomy has been created where humans should be “hands-off” and not set foot in nature, lest they “disturb” or “disrupt” natural ecosystems. In reality, we humans are a part of nature, deeply connected to and dependent on all other species for our survival and continuance on this planet. However, it is also apparent that we would not, nor should not, sacrifice ourselves as a species in order to protect nature, since we are inextricably part of this planet’s biome just as is every other species on earth. The paradigm of humans as separate or outside of nature has effectively doomed most environmental action to the status of window dressing, preventing any truly meaningful, long-lasting change toward the end of real sustainability. Permaculture, a holistic design science which attempts to reintegrate humans into the landscape, was first developed by Bill Mollison and David Holmgren in the 1970s and 1980s. Permaculture’s three ethics – earth care, people care, and future care – are implied to be three aspects of the same concept. Over the years of permaculture’s development and practice in the context of the environmental movement, itself in the context of the human/nature separation paradigm, people have naturally tended to emphasize earth care over the other two ethics. This is evident in the fact that most people today tend to think of permaculture primarily as landscape design or as an agricultural, gardening, or homesteading method. If one of the three permaculture ethics is missing or deemphasized, then the other two ethics break down. Tim Winton describes an example of this disintegration in this article, which starts with his experiences at Tagari Farm, a permaculture proof-of-concept farm designed and established by Bill Mollison. While all the members of the farm came together in like-mindedness and worked hard at the earth care aspect of permaculture, the farm as a whole eventually suffered because the needs of all the people involved were not being met. A lack of structure and a prioritization of earth care over people care meant that people burned out on the project, realities fell short of expectations, and that tragically, a member of the Permaculture Institute took their own life. We as permaculturists too often have overemphasized the earth care aspect and are still viewing the care of the earth/environment as separate from caring for ourselves as human beings. Often when we design with permaculture, the more subtle needs of people are ignored or misunderstood, or the design has unrealistic wishes for what the people will be able to do and when they will be able to do it. If we create designs that don’t take into account all of our personal needs, behaviors, and cultural context, then we are not creating effective, holistic designs that meet all three permaculture ethics. Human beings, especially those of us living in high material wealth societies, have trouble understanding our own needs a lot of the time. The first step in people care is to identify our needs – observing ourselves as we might observe a landscape to gather information for our design. Increasing our awareness of our true needs in the first place leads to better understanding the needs of the earth, and the needs of future generations of people. Only when we have identified what our needs are will we be able to put them in the appropriate relationships with other elements so that they work for and not against the system. Ultimately, to achieve permanence, we seek to integrate ourselves into the landscape – as is our rightful place – as functional players in a functioning ecosystem. 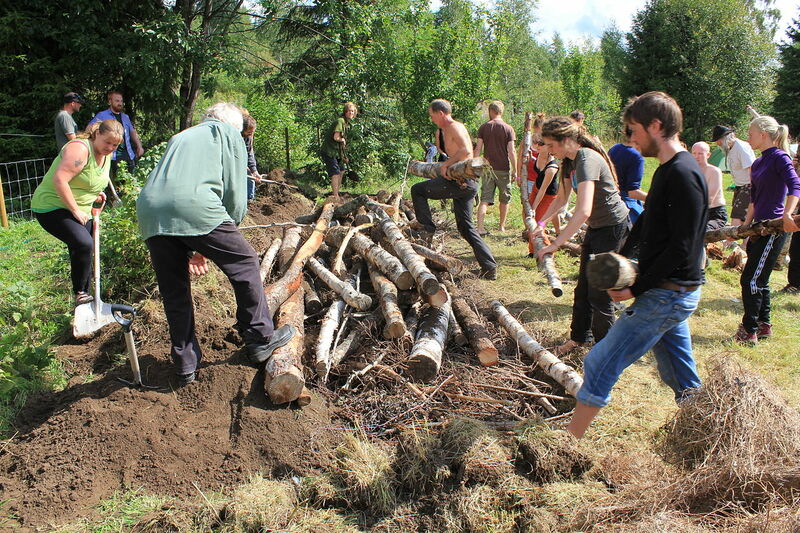 Permaculture’s holistic view requires the integration of all three ethics: earth care, people care, and future care. Prioritizing one of the three ethics means we “unprioritize” the other two, thereby negating the possibility of a “permanent culture.” When we balance the meeting of our real human needs with the needs of the earth to sustain itself and with the needs of future generations to provide for themselves, then and only then are we living in an ethical and permanent way. A simple action that we can take to assess whether our design is balanced is to state explicitly how it fulfills each of the three permaculture ethics – essentially, to use the ethics as a design tool. More about this at liberationecology.org. A lack of design for people care is the inspiration for Looby Macnamara’s book People & Permaculture. This book is an excellent and highly recommended exploration into what people care really means, and a useful tool to begin discovering and designing for our human needs. For more on future care, and why we use that term instead of the more traditional “fair share” or “set limits and redistribute surplus,” see our past post Future Care.